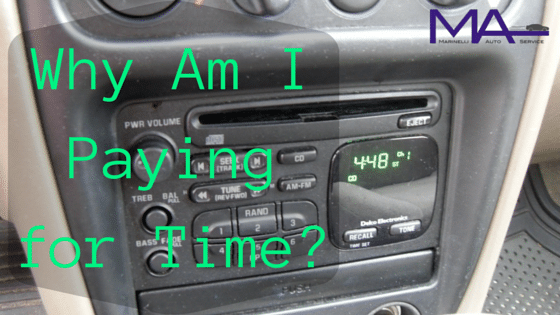 Understanding Your Bill: Part 1 – Why Am I Paying for Time? by The Mechanic's Wife | Sep 1, 2015 | Did You Know? You leave your mechanic shop with your car running well again, but there’s a bit of anxiety embedded in the invoice you’ve thrown onto the passenger seat. You head home to look up your bank account balance and calculate how many days until your next paycheck. I understand that anxiety far too well. Understanding money matters has never been my strong suit. Understanding money matters related to my car was even weaker. Now that I am immersed in the context of car repairs on a regular basis, some of that anxiety has been replaced by knowing that a job well done is worth the cost, and you often get what you pay for. In this three-part series I will help you understand your auto repair bill in terms of diagnostics and labor rates, mechanic’s pay, and parts mark-up. Diagnostics, or the process of finding a fault in your vehicle, is just that – a process. Many people have fallen under the false assumption that they can have a free code scan done on their vehicle to figure out which part is causing their problem, and then simply have that part replaced. Voila!, the vehicle is fixed. Maybe. Maybe replacing that part will fix the problem. On the other hand, if you replaced multiple parts but really only needed one, which one actually fixed the issue? Or possibly, the part you did replace seemed to have fixed the issue at first, but the problem returns down the road. I’m not saying all code scans are bad. Scanning the vehicle for trouble codes is an important, preliminary step of the diagnostic process. This initial step often helps a technician determine where to start in diagnosing the vehicle. Occasionally the process to confirm a problem is quick. However, depending on the cause of the problem, it may take a lot of time, research, analysis, and troubleshooting to get down to the actual root of the issue. During this time, the technician must use a variety of tools and resources to diagnose the problem. These tools are not free for techs, the resources are not free for the shop, and time is not free for either. Adequate charges for diagnostics is what allows the business to cover the price of tools, resources, time and other costs that keep the shop running. The details of this would be another post entirely, but I provide an introduction in my post, Dollars & Sense: Are Free (or Cheap) Diagnostics a Myth?. If you are relying on cheap or free diagnostics, you are likely setting yourself up for a bumpy ride. The technician is probably not getting paid fairly for the time she is spending on your vehicle, causing her to rush so she can start on a job that does pay. So, the diagnosis is not properly confirmed, meaning the recommended fix may or may not be the right repair. You risk having to bring your car back to shell out more money for repairs. Competent diagnostics take time, and paying fairly for them will yield better results for you in the long run. The same applies for any labor charge for your vehicle. The tools, equipment, knowledge, and resources used to properly repair your vehicle cost both the shop and the technician. These costs, along with the technicians pay and the shops profit, affect the labor cost you find on your bill. A technician not being paid fairly is more likely to cut corners and take less care to do the job right. A shop owner who feels he may be losing money on a job is more likely to rush the technician, causing him to skip steps or miss something inadvertently. Like in diagnostics, fair labor rates will increase the likelihood that your vehicle’s repair will be accurate, preventing you from returning with the same problem too soon down the road.